Shadow Adventure is a Sonic Adventure DX: Director's Cut (PC version) hack made by Dude. 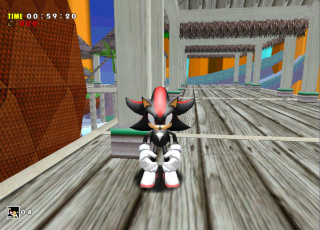 It changes the main character to Shadow the Hedgehog, and features layout and texture edits of several levels, such as Emerald Coast, which is made similar to Palmtree Panic from Sonic CD, and Station Square, which is turned into the original level Station Spaceport. Only one demo is available at the moment. However, a patch to the demo with a few changes was released on Dude's 16th birthday. The hack has been indefinitely discontinued. And the most enjoyable part of the game, redesigned item layouts in every level. As of November of 2008, Dude has resumed work on Sonic Adventure hacking. His new project has helped pave the way for more functionality and hacking capabilities in the SADX scene. This page was last edited on 15 April 2018, at 12:59.